Lancaster, Pa: Lifestyle Baby Photo Session, Caroline. Caroline Mae. This bright eyed baby girl was pushing two and a half months when we did her baby pictures. 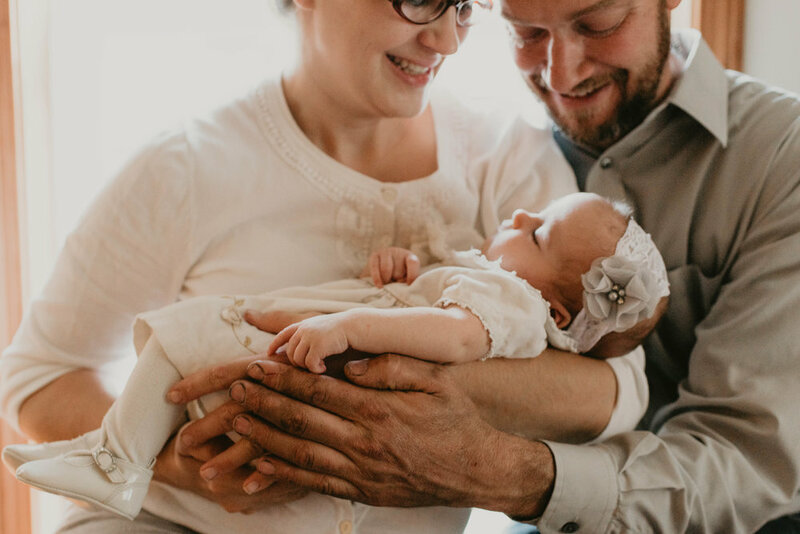 One thing I love about lifestyle sessions is that it doesn't matter how old your baby is, we will still get beautiful, emotion filled, photos. For lifestyle sessions, baby can be awake or asleep. And if they decide its time to eat, no problem, we take a break for that too. Caroline started her session wide awake. With her belly full, she was ready to shine. At 2 months old she was not camera shy and content to be adored by mom and dad. She even rewarded us all with some charming smiles. All that snuggling and kissing and cooing eventually wore her out and by the end of her hour long session she was fast asleep. The images taken have already been put in an 8x8 heirloom quality photo album. One thing I love about being a full service photographer is that I get to see the whole completion of the photography process! Start to finish, I do the work for you to ensure the photos are printed and delivered.